Historical sources inform us of the uprisings of the Macedonian Sclavinii in the 9th century. "...for two years (821-823) the imperial City (Constantinople) was besieged by Thomas the Slav helped by ... de Asiae et Europae patribus, Thraciae, Macedoniae, Thessalonicae et circumiacentis Sclavinis... In the end the tyrant was mercilessly defeated. "The chronicles of 836-837 say that an anonymous archont, a duke of a Slavinia nestling in the "forests of the Slavonic territories", also led his people in an uprising and "blood flowed like a river, and the surroundings were all on fire". Scholars claim that the place in question was Solun (Salonica or Thessaloniki) and the forests surrounding it, in which were infested many Slavs. Not having the strength to fight the encroaching Russian and Byzantine pressures, the Pre-Bulgarian Empire fell in 972. According to the sources the first favorable opportunity for an uprising had occurred three years before, in 969. The real opportunity, however, presented itself in 976 when the Byzantine Empire, led by Vasilius 2nd, became a whirlpool of historic events: a civil war had begun and once against the Comitopouloi rose in Macedonia. 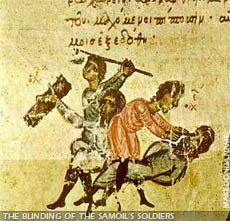 The uprising was fatal for the two elder brothers of Samoil, Aaron and Moiseus (Moses); the third, Aaron, was killed by Samoil himself. The uprising spread swiftly from the Macedonian territories throughout the Balkans. The year 986 was probably the most significant year for Samoil. He failed to conquer Solun (Thessaloniki, Salonica), but bit deeply in Greek territory, Samoil conquered Thessaly region with Larissa. In his chronicle John Scylitsa says: "...he brought the remains of Achilles, the holy Archbishop of Larissa from the time of Constantine...to Prespa, where his court was". The Devol Bishop Michael adds that "... there he commissioned a beauteous, stately shrine in his name, Achilles the saint...". 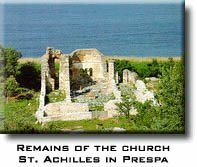 In lesser Prespa, on the island he had anointed and sanctified with the holy remains, Samoil erected a magnificent three-aisled basilica. The remains of Achilles were laid in the diaconicon in a wonderfully decorated sarcophagus. A depiction of Achilles was also painted. In the apse, Samoil presented visually the judicial system of his independent Patriarcharte. The frescoes painted on the back of the seats in the synthronos contain written on all the administrative centers in this ecclesiastical institution. Tine and the tempests of history have eroded the monuments. Today only fragments of the edifice and the frescoes have survived. The gates of history were opened even wider for Samoil when a struggle over the Byzantine crown developed. The emperor was saved by the Russian troops - 6000 Varangians - sent by Prince Vladimir. Vasilius promised Vladimir a a reward - the land of his sister, the porphyrogeniti Ana, - on condition that the Russians were converted to Christianity. The condition was satisfied (988/989) but the promise was not kept. According to his chronicler, Vladimir, endangered, and deceived, avenged himself with a years-long siege of the Byzantine city of Herson, and a military and political alliance with its neighbor on the Black Sea, Samoil. The princess, however, reached Herson and the link between Samoil and Vladimir became a bridge in the "transplatation" of Christian learning in the youngest and, at the same time, the largest member of the Christian family. It has been discovered that the famous Novgorod pages are the remains of the Macedonian Imperial Gospel from the 10th century, probably sent by Samoil together with other books. The unquestionable relationship between the 11th century Russian manuscripts, the 10th century Ohrid Glagolithic version and the Preslav manuscripts provides the basic information about the formation of the Old Russian orthography on the foundations of the Macedonian and Bulgarian tradition. "Map of the Samoil's kingdom"
When Vasilius 2nd set off his campaign against the Arabians in Syria, Samoil did not waste any time and continued with his conquest. According to John Scylitsa Samoil established a great Empire, with its seat first at Prespa and later in Ohrid, thus uniting territories between Danube, and the Balkan mountains, Thessaly, Epirius, Albania, Raška and Zeta which were simply annexed to the already existing state. The prince of Zeta, John Vladimir, tried to resist but was soon subdued; the Byzantine strategy was effective once again: the prince became Samoil's son-in-law, the husband of Samoil's daughter, Theodora-Kosara. Samoil's state was formally modeled on the old Bulgarian Empire: a feudal state with imperial rule. In the mind of the Byzantines there was only one empire - that of the Bulgarians. The oecumenical Church of Constantinople allowed the existence of only patriarchate - the Bulgarian one. Samoil, however had created a new state, radically different in both contents and character. Samoil had created a new empire. If his intent had been to re-create the empire of Simeon and Peter, he would have conquered and established himself on the old Bulgarian territories. The sources, however, testify that he obviously "did not make great efforts east of Serdica". 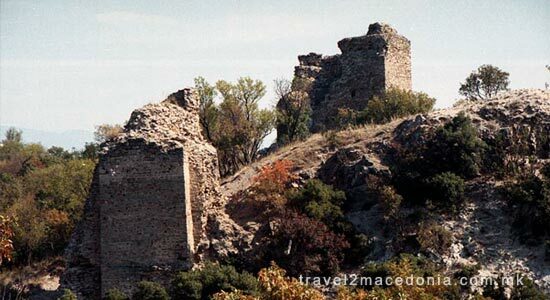 His efforts and interests were aimed at Macedonia, the old one, with its nucleous in the Prespa and Ohrid region. The Ohrid Literary School was still active: Glagolitic prevailed but the Cyrillic alphabet was being introduced. The Byzantine reaction against Samoil's reign started as early as 1001. Emperor Vasilius 2nd being superior in experience and military tactics, he held Samoil's Empire in vice-like grip, between Skopje and Voden (Edessa). Samoil fought back until the autumn of 1014. The historical records do not say much: just that on Belasica, Samoil's army was ambushed and brutally defeated. Samoil survived by fleeing to Prilep. Vasilius for his part after thirty years of ire, marked his victory in a ruthless, unprecedented way. The military leader Catacalon Cecaumemus in his Instructions (Strategion) dedicated to his son, states that by royal order the eyes of the fourteen thousand soldiers were gouged out; every hundredth soldier was "pardoned" and left one eye to lead the wounded multitude to their tzar, Samoil. According to Jovan Scylitsa fifteen thousand soldiers made up Samoil's army. Samoil of Macedonia did not survive the sight; when the procession of blinded soldiers reached Prilep, his heart, otherwise audacious and strong, could not endure it; he died a historic figure on the 6th day of October, 1014.
the village of German, Prespa District"
Shortly afterwards, in four year's time, his kingdom was dismembered. The state continued to be undermined internally: first the successor to the throne, Gabriel Radomir, perished from the hand of Aaron's son Ivan Vladislav, and then, due to a contemptible deceit, the Prince of Zeta, Jovan Vladimir was also killed. Vladislav himself died in February 1018 in the battle of Dyrrachium. ... one's fall is another rise... Vasilius 2nd, celebrating the fall of his greatest obstacle, made a ceremonial entry into Samoil's fortress in Ohrid; Vladislav's widow, the Empress Maria, welcomed the emperor and vowed obedience. The empire stretched from the Armenian Mountains to the Adriatic, from the Euphrates to the Danube. Writing history, the victor divided the territories of Samoil's Kingdom into themes; the central part constituted the Bulgarian Empire. In the chronicles however, this same territory is referred to as the "Macedonian lands", "Macedonian regions". Scylitsa-Cedrenus even mentions a Vasilius the Macedonian and later another, a Gregorius of Macedonia. Vasilius 2nd, who was strongly opposed to the large scale ownership of land, whether by noblemen or monasteries and a favor of agrarian reform, and who was renowned for his cruelty and impunity, proved himself quite moderate with the conquered territories. His wisdom is best reflected in the autonomy of Samoil's Patriarcharte which was, nevertheless, reduced to the rank of an archbishopric. 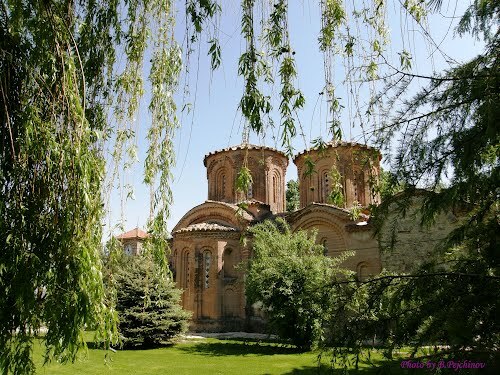 Through the Ohrid Archbishopric, which was subordinated to him alone, Vasilius, who personally appointed its archbishops, very cunningly assumed control over the church life, especially that of the Macedonian Slavs, thus avoiding the expansion of the ecumenica.